Born in Buenos Aires of a Paraguayan father and an Argentinean mother, Victoria Stagni apprenticed in oil painting at Pierre Lafage (a graduate of the Beaux-Arts in Paris and Bordeaux) in the Atelier Fine Arts of Bordeaux. At the same time, she sets up her workshop in the Bordeaux district of Chartrons. Her figurative painting oscillates between realism and fantasy. Indeed, her imagination feeds on the works of great writers in Latin America such as Gabriel Garcia Marquez or Alejo Carpentier, where lush nature often holds a prominent place. This "magical realism" inspires figurative, colorful and luminous canvases in which characters are represented in a fantasized nature, surrounded by a bestiary, sometimes friendly, often threatening. Since 2015, Victoria has been part of the collective of international artists "Human Beings, What Unifies Us?" composed of Cuban, European and American painters, sculptors and photographers. This collective was created following the reopening of relations between the United States and Cuba and aims to spread beauty and peace in a sense of brotherhood. In June 2016, the artist participated in the inaugural exhibition of the collective at the Ortiz Gallery in Trinidad, Cuba. 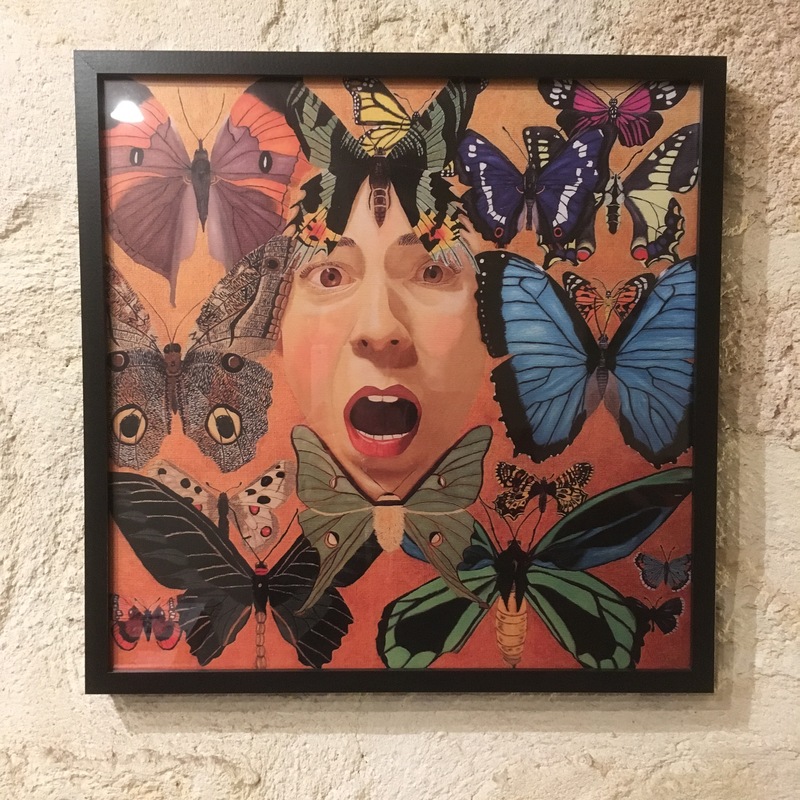 Recently, the painter presented his works at the Marché de Lerme in Bordeaux during his solo exhibition "Rêveries sauvages", an event organized with the support of the Mayor of Bordeaux. Then followed several other exhibitions in Bordeaux including open air by Ôboem, a start-up that works to replace the urban display of advertising with works of art. Victoria has just exhibit her works in a personal exhbition "Animal dream" at the Bernard Magrez Cultural Institute, from the 28 of february to the 25 of March 2018. 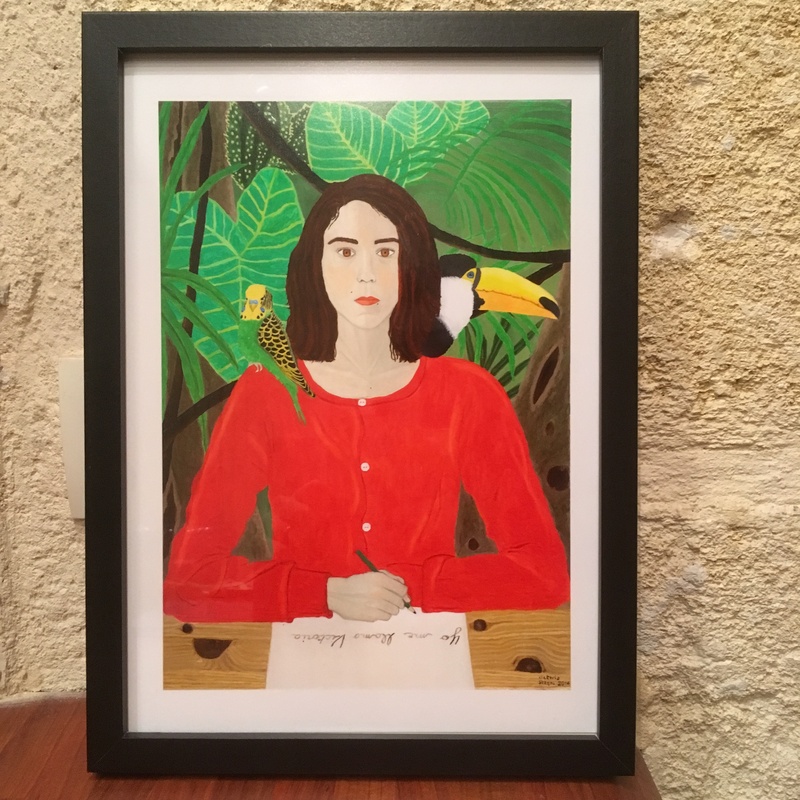 Now, two of her paintings, "Animal Kingdom" and "Self-Portrait with Amaryllis", are part of the Private Collection of the Bernard Magrez Cultural Institute. 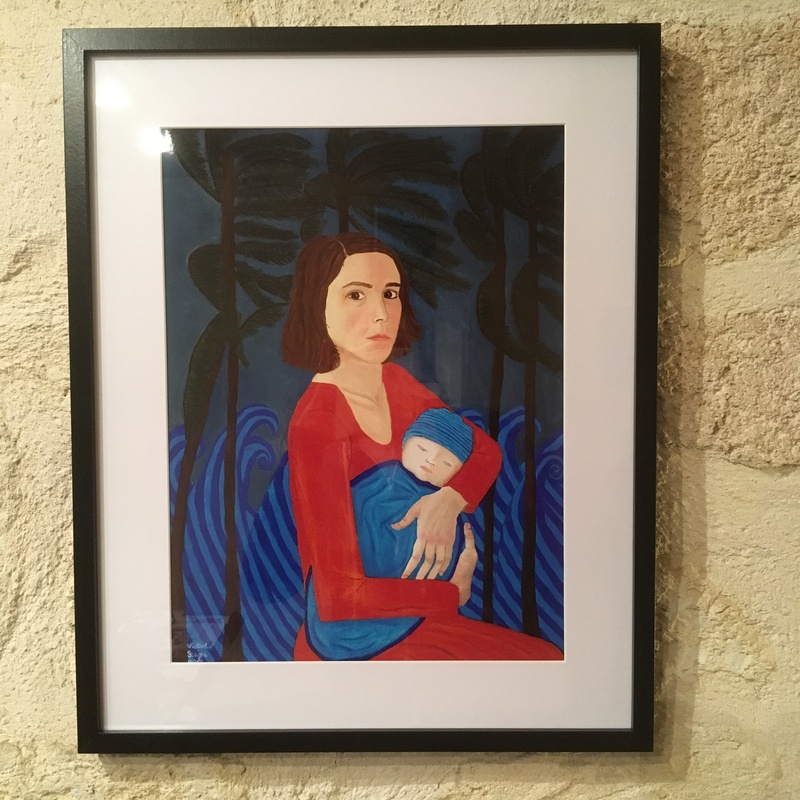 Following this event, Victoria Stagni has just exhibited her work in solo exhibitions firstly at the Gallery of the Hotel Relais and Château Le Saint James in Bouliac, from September 2018 to January 2019, as well as 'at the Monkey Mood Gallery, in March and April 2019. "One hundred years of solitude" is a harbinger of an obscure future. Victoria Stagni shares her exacerbated sensitivity to the world. She tells it through stories painted in oil that oscillate between personal stories and collective stories. She sometimes feels them more than she conceptualizes them. She says that they are often instinctive or unconscious and that she is driven by a vital, even visceral, need to paint them. This is his outlet. It is the violence of our time that overwhelms it. Paradise is long lost. "Real disasters are here and there" *. We leave the exoticism of the nineteenth century to find ourselves in the era of the Anthropocene. From her golden cage, with solitude and through her self-portraits, she speaks of multiplicity. Like a contemporary allegory, she uses her own image to highlight our collective responsibility, which she does not hesitate to endure in the face of disaster. This disaster is ecological. In his last two canvases his self-portraits give way to a representation of Trump. Maybe she disappears because she has become an animal. From the "pack" man, she extracts an anomalous being, a political beast, billionaire, racist and misogynist in a tie suit, the president of the world's leading power that alone symbolizes this catastrophe by mass contagion. "Make Nature Great Again", she becomes a white-headed pyguarde, the emblem of the United States. Becoming-animal is a work on oneself that requires asceticism. It is undoubtedly since this state of immanence that Victoria Stagni paints. Becoming-animal is an inner exercise, it is a becoming-imperceptible that invites us to deterritorialize. "Victoria Stagni's work consists primarily of representing the living from a human subject that she immerses in a dreamlike composition. And if the artist often chooses the self-portrait to do so, it is because, like Frida Khalo, she is "the subject that [she] knows best". The artist uses the dream to be completely free. On the web, she can authorize everything she wants to evoke the mystery of the world. When she creates, Victoria Stagni looks for images that will surprise and enchant, even if this dream is on the verge of a nightmare. It is concerned primarily with the image as such, its inexplicable nature, rather than the idea. In the end, through her painting, Victoria Stagni seeks to share her sense of belonging to an enigmatic and wonderful world. Her subjects are feminine because the image of a woman's body or face is spontaneously imposed on her face to the canvas. Thus, his painting is deeply feminine, even feminist. When it is not a question of herself, she likes to paint strong women, sure of them, mistresses of their destinies. Her relationship to painting is sensory and sensual. Before starting a new painting, the painter takes particular care in the choice of colors. The latter, by their brilliance and vivacity, retranscribe his feelings and sensations and give their equilibrium to his creations. As Matisse said: "I feel the paintings by the colors, it is according to the colors that my paintings are organized". "The Victoria Stagni exhibition invites us to an animal dream. His subject, topical: tribute to the animal powers, these other tenants of the Earth that humanity tends to forget. Its oil formats celebrate their beauties, mixing realism and fantasy. Figure of the tiger or gigantic crocodile, become elements of a landscape or piece of fantasy furniture. The magical mountain. Self-portrait with tiger and gorilla. The cage- Self-portrait with birds. Yo me llamo Victoria- Self-portrait with parakeet and toucan. Exhibition "Maiz, Corn, the tribulations of a traveling seed"
I am pleased to invite you to the opening of my next exhibition, "Becoming Animal # 1", which will be part of a cycle of three exhibitions on the same theme. Follow artists Catherine Arbassette and Chantal Russell Le Roux. "Becoming Animal" will inaugurate the new Monkey Moon Gallery, in front of Saint Michael's Basilica. We are waiting for you on Thursday March 7th from 6pm! Publication of a beautiful article in the Junk Page magazine of the month of march:-)! Thank you for this beautiful press kit, l'Agence Ceative! Inauguration of the new section "A day with"
The online art gallery Singulart has chosen to interview me to inaugurate its new section "A day with". I am pleased to announce that after joining the online art gallery Kazoart, I have just joined the international art gallery Singulart, which brings together about a thousand artists from 50 different countries. 65 artists and 25 children from the school of Pedro A. Santos, Yucatan will participate in this exhibition: paintings, photos, drawings, weavings, engravings, sculptures, installations ... which will be accompanied by animations, in collaboration with the Machine to read , the Saint Pierre Animation Center and the Cervantes Institute. Corn is a grain native to Mexico, where it has been grown and consumed for over five thousand years. Hybridization and genetic manipulation have exploded the number of varieties, such as Monsanto's MON810 (banned in France). The cultivation of maize for animals has invaded many French regions, polluting, depleting and drying the soil. To preserve the biodiversity and culture of ancient species whose nutritional value has enabled the survival of many populations and against these drifts, artists from here and elsewhere have been asked to tell this story in an original creation. The opening of my exhibition in the Gallery of Relais and Castle of the Hotel Saint James took place last night. It was a very beautiful evening in a wonderful setting. The exhibition lasts until January 5, 2019, run it! I am pleased to announce that my next exhibition of paintings will be held at the Art Gallery of the Relais and Chateau Hotel Saint James, from Tuesday, September 11, 2018 to Saturday, January 5, 2019. Come many! Publication of a beautiful article in the newspaper Sud Ouest of September 26, 2018 about my current exhibition at the Hotel Relais and Château Le Saint James. In the heart of summer, I will have the great pleasure, with the support of Bordeaux City Hall, of exhibiting my new paintings at the Halle des Chartrons. 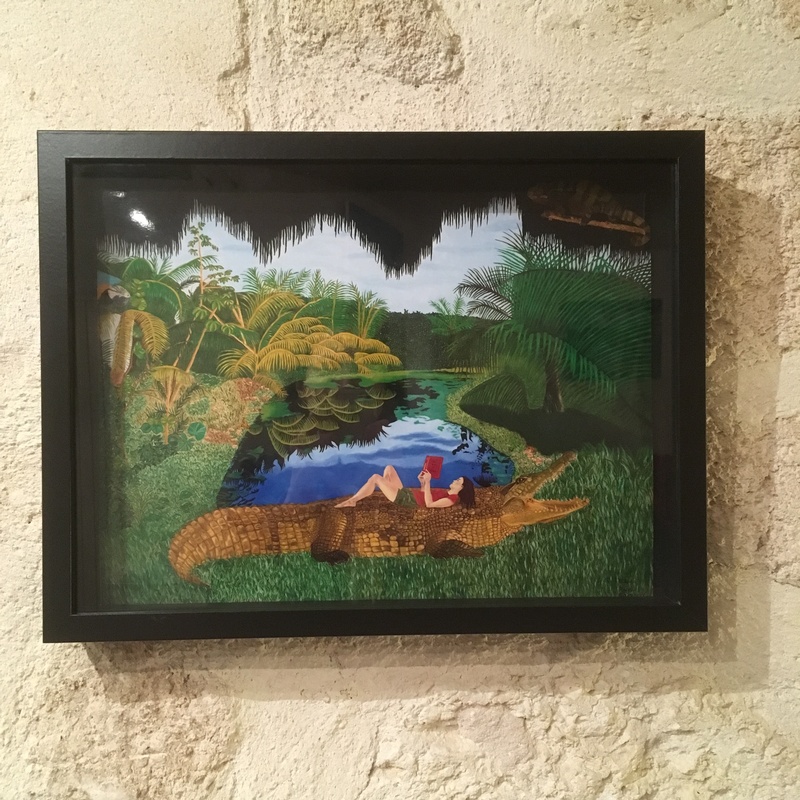 A very nice article signed Cécile Martet, published on the website of the art gallery Kazoart, about one of my last paintings, "Lizards". I am pleased to announce that two of my paintings, "Animal Kingdom" and "Selfportrait Amaryllis" are now part of the private collection Bernard Magrez. Kazoart's three years of existence: let's celebrate it together! During the evening celebrating the three years of existence of the online art platform Kazoart, I will have the honor of exhibiting my paintings at the café Mancuso. My next solo exhibition, "Animal Dream", will take place at the Bernard Magrez Cultural Institute, in the Galerie des Nouveaux Talents, located next to the magnificent Château Labottière. The opening of the exhibition will take place the February 28 from 6 pm. Come and see us! The exhibition will last until march 25.
to present my work to the public. On Saturday, March 3rd and 17th, there will be creative workshops for children "Dream Animals" around my work, at 3pm. Young budding artists are welcome. Click here to see a beautiful film about my exhibition "Animal dream" at Bernard Magrez's Cultural Institute, until the March 25. Publication of my portrait in the magazine "Mag in France"
That's it, the poster campaign Oboem just begin! From 18 till 25 October of this year, seventeen artists of the campaign *OBordeaux actually see their works shown in the public place in Bordeaux on 70 advertising hoardings in size bus shelter. I have the pleasure to see my picture " Animal Kingdom " post on 10 advertising hoardings in total:-) One of them is ideally located on the beautiful place of Quiconces, during two weeks, from 18th of october till 1st of november! If you are in Bordeaux, walk in the streets of Bordeaux and go to see the works of the artists Oboem! For the second consecutive year, I will take part in the Art'Igues collective exhibition organized by the City of Artigues Near Bordeaux. This exhibition and sale will take place in the magnificent setting of the castle of Bethaille, the weekend of 7 and 8 October 2017. Hi! I have been selected for the first poster campaign of the start up Oboem, a website who wants to exhibit artwork instead of advertising in the street. You like a piece of art in particular? You can acquire a reproduction a allow an artist to expose his artwork in the street. Thanks to your contribution, the city will become a gallery for the delight of all. The first poster campaignwill take place in the center of Bordeaux in the beginning of september. Thank you very much! My next exhbition will take place from the 2nd of june until the end of september, in the decoration store Julie Marie Moro, in Bordeaux, near the Pey Berland Place. The opening will be on the 2nd of june, at 6 pm, 29 rue du temple. Painting exhibition on the Marché de Lerme, from the 20 of october to the 1st of november, in the Saint Seurin district, in Bordeaux. The opening of the exhibition will take place the 20 of october, from 6 to 8 pm. I wil participate to a colective exhibition on the femininity theme, organized by the Artigues Près Bordeaux Municipality, the 15th and 16th of october. Ten artists have been selectionnated to participate to this event, who will take place in the wonderful Bethaile's Castle. Painting exhibition on the Tatry Gallery, in Boesner Shop, from the 1st of september to the end of the month. The Bordeaux's Town Council had just announced me that now, I am officially a Painter from the City of Bordeaux. Human Beings, What Unifies Us? Participation in the collective exhibition "Human Beings, What Unifies Us?" from the 28th of May to the beginning of July, within the beautiful Art gallery Universel Ortiz, in the magnificent city of Trinidad. Collective exhibition with 10 other Cuban artists, of whom in particular painter Yudit Vidal Faife, who will represent Cuba to the United Nations in New York next December as well as Jorge Cesar Saenz and Carlos Manuel Castillo, talented sculptors and Cuban painters. This exhibition aims at being itinerant and at travelling soon in the United States and in France. Participation to the Art Workshops, Open Doors, on 19 and 20 september, as part of the European Heritage Days . The saturday, the workshop will be open from 12am to 20 pm. The sunday, from 12 am to 18 pm. "The fantastic and bucolic world of Victoria Stagni"
An article in the website "Terres de vin"
The Oboem Participatory Financing Platform proposes to fill out the billboards usually reserved for advertising by works of art. Et si on remplacait les panneaux publicitaires par des oeuvres d'art? Bordeaux: who wants to replace advertising by pieces of art? Press article on the website "nouvellequitaine.sortir"
Press article on the website "tousvoisins.com"
Victoria Stagni is part of the group of artists "Human Beings, What Unifies Us?" Publication about the artists's groupement "Human Beings, What Unifies Us?" For any purchase of original works, please contact the artist directly via the "Contact" section below. The artist can make a portrait on order according to photo. The price of the ordered portrait varies according to its size. The Digigrafies are digital reproductions on painter's canvas. These reproductions, in limited edition, are valuable works of art, and can be realized on canvas of painter (canvas 350g), put on frame, signed and numbered. You can of course order reproductions in other dimensions than the original paintings. These prices include postage costs in metropolitan France. For any other request of prices, you can contact us by "Contact" item. You can also order reproductions of all paintings on 115g or 130g framed satin or photo paper, framed. These prices are excluding postage.